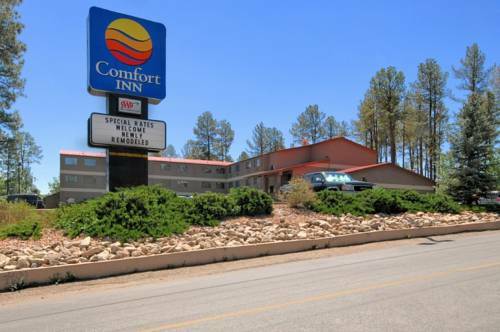 Rest and refresh at the Comfort Inn Midtown hotel in Ruidoso, NM. We give our valued guests easy access to such nearby attractions as Ski Apache, Sierra Blanca Peak, Ruidoso Downs Race Track, Billy the Kid Casino, Mescalero Lake, Ruidoso Convention Center and Eagle Creek Sports Complex. Get ready for the day with such amenities as free WiFi, free ample parking, free hot breakfast, free coffee, fitness and business centers, indoor heated pool and a hot tub. Behind every great day is a great night in your cozy guest room, which features a coffee maker, hair dryer, HDTV, safe, iron and ironing board. Also, earn rewards including free nights and gift cards with our Choice Privileges Rewards program. 30 feet high, and painted in bright colors not seen in other giant nuts. Or at least the skeleton of a dinosaur, made of spare parts. Artwork on an outdoor water tank chronicles the history of the U.S. space program. Inside, displays include a model of the forgotten Space Station Freedom.